Great Greens That I Love! Cryptomeria japonica is called Japanese cedar and is the national tree of Japan. Here in CT, it can grow 50-60′ tall! This tree is at the top of my wish list, and I have finally cleared an area of my yard of invasive vines and have a spot where I know it will be happy. Meanwhile, we harvest Cryptomeria from a few places where our yearly pruning keeps it from getting too large. 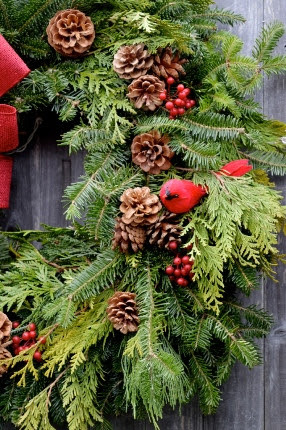 The texture is unique and it holds up really well in wreaths and swags. There are many compact, dwarf forms available; maybe I should plant a few of those as well! 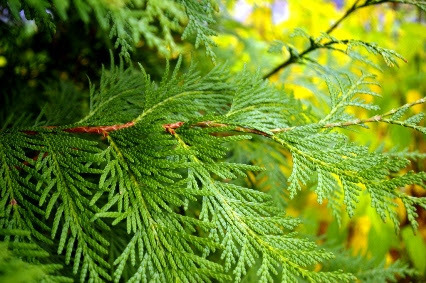 At this time of year, I dream of the many new evergreens I will install next year. I was pleasantly surprised to find out that one of the very best, longest lasting greens that I now harvest in abundance from my yard is ‘Green Giant’ arborvitae. I must admit that I have now planted six of them in order to achieve privacy quickly. I climb a tall ladder and tip them back in the front and back, leaving the sides alone to fill in and continue on their mission of hiding the neighbors nearby. In this wreath above, you can see how I have added bunches of ‘Green Giant’ to a plain Fraser fir wreath. It adds a nice contrasting texture and provides the perfect backdrop for cones, berries, and a red cardinal!